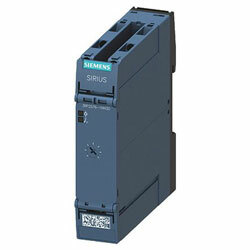 Siemens SIRIUS 3RP25 series time relays, available now from RS Components, are used in starting, control, and protective circuits for all switching operations concerning time delays. Their completely developed concept and space-saving, compact design make the time relays perfect modules for control cabinet, switchgear and control manufacturers in the industry. Due to their slim-line, space-saving design from 17.5mm, these time relays are particularly fitting for use in smaller control boxes, such as heating, ventilation and air-conditioning systems, and in compressors. All of these time relays in this enclosure version are ideal for snapping onto TH35 mounting rails in accordance with IEC60175. The device offers a transparent program with seven basic units for the time relay. Logistical advantages are offered by versions with wide voltage range and wide setting range. No tools needed for assembly or disassembly on standard mounting rails. The device offers cadmium-free relay contacts. Environmentally friendly laser inscription is provided instead of printing containing solvents. Versions with screw-type connection or with spring-loaded/push-in technology are offered.